Welcome to the Wonderful world of Intersectional Peonies, the peonies of the New Millennium. Nickname or common name: Itoh Hybrids. If there would be any flower of which ‘the praise is sung’, it is undoubtedly the ‘Queen of Flowers’ and ‘the Flowers of Flowers’, Paeonia. Paeonia has a long standing reputation. It is the favourite flower of people since ancient times, not only because of its extraordinary beauty, its big corolla, gorgeous colours ;elegant appearance, various shapes and numerous varieties, but also because of the fact that it has been regarded as the symbol of friendship; happiness; love; luck and peace. Considering the above, it is quite understandable that Valerie Easton, writing about Intersectional Peonies, says: they offer beauty and strength and are blessed with the best attributes of their parents, the herbaceous peonies and tree peonies. The flower colours are scrumptious, from watercolour pink to orange, copper, deep red and pure yellow. A single bloom is a flower arrangement all by itself. But the real miracle of Intersectional peonies is that they develop more than one bud per stem. This means you get at least a month of bloom as one flower opens after another. Each mature peony produces an astounding bounty of 30 to 50 blossoms over a single season. So, the ‘praise is sung’ also on the New Line of Peonies, a new way of life in the garden. The very beginning of breeding Intersectional peonies goes back to last century. It was the dream of many peony hybridizers to create a deep yellow, large flowered, easy-to-grow herbaceous peony. If the superior floral qualities of the yellow-flowered tree peonies could be transferred to herbaceous peonies, the goal to create a yellow flowered herbaceous one, the problem would be solved. But according to conventional wisdom, the genetic barriers between tree peonies and herbaceous peonies ruled out any attempts to cross the two groups. This seemingly unreachable goal, however, has already been achieved; in fact, the earliest examples of these ‘improbable peonies’ which now come in a wide spectrum of sumptuous colours—are today nearly 50 years old. It was the vivid Japanese, amateur gardener Mr. Toichi Itoh, who succeeded in crossing Paeonia x lemoinei, a hybrid tree peony, with Paeonia lactiflora Kakoden, a white flowered herbaceous peony, using the latter as the seed parent. Before I continue writing about the success story of Mr. Itoh, the readers should know that literature makes mention of three herbaceous yellow flowered peonies. 1. Paeonia mlokosewitschii, common name: Golden Peony or Caucasian Peony. It was the first yellow-flowered herbaceous species, in 1897, discovered by the Polish botanist Ludwik Mlokosiewics near Lagodechi, a small town in the Central Caucasus region, and that’s why Alexandr Lomakin named it after him. As the name of the species ‘mlokosewitschii’ hardly is to pronounce by non-Polis people, it humorously is nicknamed: “Molly the Witch”. Paeonia mlokosewitschii is native in Azerbaijan; Georgia and Dagestan. It is a perennial plant of 60-70cm tall. It is a rare, single lemon-yellow flowered and seldom offered variety, produced from seed. Specialists say that you may expect only plants from the blue coloured seeds. The best time to sow the seeds is September. 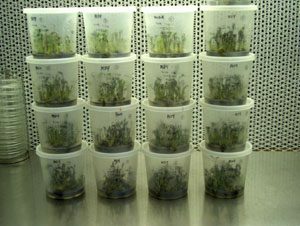 The germination can take up to 2 years. 2. Paeonia Huang Jin Lun: Golden Wheel. Synonymes: Aurea; Minuet; Goldmine; Oriental Gold; Yokihi. 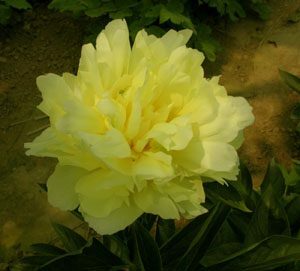 According to Chinese botanists, Paeonia Huang Jin Lun(true translation: Golden Wheel) is one of the best, non fading yellow herbaceous peonies in China and a very choice cut flower. Huang Jin Lun turned up during the Japanese occupation of north-eastern China in the 1930s and discovered blooming on the grounds of the last emperor’s palace in Changchun, in the heart of Manchuria. It was brought to Japan, where it became known as Yokihi and introduced into cultivation. It is a crown shape one, with a flower size of 15 x 9cm and a plant height of 90cm, having stout and erect stalks. It is a rare and unique cultivar. It culminates all the favourite characteristics of a peony flower, so the Chinese. Everything on this plant is yellow. The foliage is yellowish green; the buds are yellow and the roots are yellow. The variety is therefore quite easy to identify. The Chinese claim that Golden Wheel is the only real yellow herbaceous lactiflora peony. Outside China, some botanist do doubt if Paeonia Huang Jin Lun is a real lactiflora type. They do believe that it is just a new discovered species, considering the typical characteristics, mentioned above. However, Carsten Buchkhardt, a widely renowned authority on Paeonia says to be 100% sure that Golden Wheel is a lactiflora, though a curiosity. The parents are still unknown. A series of circuitous and mysterious moves finally brought it to the United States in 1954, where it was registered as ‘Oriental Gold’ by Louis Smirnov. 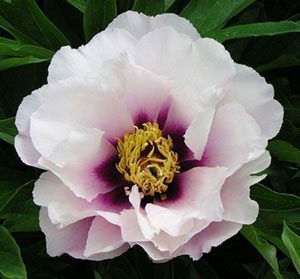 Paeonia Huang Jin Lun is widely spread since but must still be considered as a collectors item. 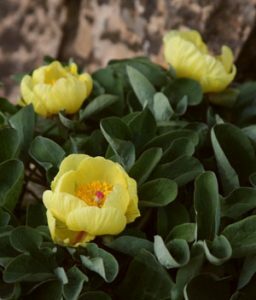 The well-known plants explorer Janis Ruksans from Latvia, discovered during a trip to Iran, a Paeonia species with flowers of ‘incredibly bright yellow colour’ which he never had seen before, except with Paeonia Itoh hybrids. Janis says that the variety he found in mountainslopes, is a pure herbaceous one of low compact form covered with large bright yellow flowers. According to Janis, it certainly is not Paeonia mlokosewitchii from Caucasus mountains where yellow hint is only slightly visible, nothing similar to his Iranian beauty. The question still remains: did Janis discover a complete new species or did he find an existing one. Janis is not sure himself. He says: ‘I am not so keen in peonies, but it might be a sub-species of another species, however, seeds of this Paeonia were offered by the late Jim Archibald, famous seed collector and distributer, who visited Iran many times’. We did some research and do believe that this particular species is a Paeonia daurica, which, according to the Botanical Journal of the Linnean Society(2003) is further divided into five subspecies: sspp. coriifolia; wittmanniana; mlokosewitchii; macrophylla and tomentosa. We greatly welcome information from our readers who could clear it up. 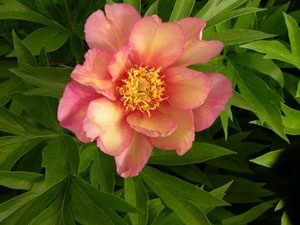 What is an intersectional hybrid peony? very large, tree peony-like flowers in colours not previously seen in herbaceous types. healthy, herbaceous foliage similar to tree peonies, but with a robust, bushy habit that does not require staking. strong, herbaceous stems that hold the flowers upright even after a heavy rain and makes a better landscape plant than older herbaceous peonies. a longer bloom time due to additional flowers being produced on side shoots. extreme winter hardiness like herbaceous types but with increased vigour. F or decades, the price of cultivated Intersectional peonies has always been extremely high because they had to be propagated by vegetative division. They were slow to multiply and expensive to produce. It was the rule rather than the exception to pay $ 1000.- and more for a 3/5 division. The demand by collectors was and is still rather great. Why these astronomic prices? First of all, the crosses are difficult to make, demanding extreme patience. Seedlings take years to a decade to mature and produce their first bloom. Finally, propagating them is dauntingly slow. Intersectional’s produce huge root systems, and their woody peony parentage means that they have tough stem bases and crowns; division therefore, is laborious and produces relatively few new plants. The intersectional hybrids have been successfully propagated by grafting intersectional stems onto herbaceous(lactiflora), tree peony(delavayii) and intersectional roots. The high value of intersectional hybrids has made them an attractive proposition for micro-propagation. After many years of research, this method of propagation has become very successful and as a result Itoh cultivars are more affordable today for less wealthy people though they will remain among the more expensive plants as it takes 4 to 5 years to grow a flowering plant. The full story of the intersectional peonies is a long one that really begins around the turn of the last century with two Frenchman named Victor Lemoine and Louis Henry (~1900-1935~) who were the first to create yellow peonies for the garden by successfully crossing the wild yellow tree peony lutea, with the large flowering Chinese tree peonies, suffriticosa. The result was a group of wonderful garden plants generally known today as “lutea hybrids”. Although at the time, these new hybrids marked an important achievement in their own right, their greater importance to the peony world was yet to be discovered for they were to become the building blocks of much greater things to come. This groundbreaking work was later continued and expanded by the great American peony breeder, Dr. A.P. Saunders who created and registered more than 75 beautiful lutea hybrids during the 1940’s and 50’s. Once again, however, his greatest contribution to the peony world may have two rare unnamed and unregistered F2 hybrids which he passed along to the Greek-born artist and breeder Nassos Daphnis (and his good friend William Gratwick of PavillionNY) shortly before his death. Daphnis understood the importance of these two rare plants and used these two uninspiring, but fertile, F2 hybrids in numerous back-crosses to the F1 hybrids as well as to the best of the Japanese tree peonies thereby creating a vast new array of back-crossed(BC) lutea hybrids, some of them which had restored fertility. Dr. David Reath, in turn, utilized some of these fertile hybrids from Daphnis to create several extremely fertile advanced-generation lutea hybrids such as “Golden Area” which has since become famous in peony hybridizing circles. Although Reath also created and introduced numerous outstanding yellow tree peony and herbaceous hybrids such as Alice in Wonderland and Lemon Chiffon, his greatest and most lasting contribution may end up being the less impressive, but highly fertile, Golden Era, because of its crucial role as an important stepping-stone on the long road to developing the intersectional hybrid peonies. Fortunately, Dr. Reath recognized the importance of his new seedlings to other breeders and made them readily available to them(as unnamed seedlings, A-198 & 199) for further breeding purposes. As a result, these very fertile hybrids such as A-199 were used extensively by breeders such as Roger Anderson, Don Smith and Irene Tolemeo and others to create literally hundreds of new and exciting intersectional hybrids. This final step would not have been possible without the crucial first step by Lemoine and Henry or any of the intermediate steps taken by Saunders, Daphnis and Reath along the way. This story helps to highlight the extraordinary accomplishment made by Itoh who somehow managed to success with the intersectional cross even though he only had relatively infertile F1 lutea hybrids such as Lemoine’s Alice Harding, to work with at that time. In the last 40+ years a number of people tried to breed intersectional peonies, with most having little or no success. Due to the limited scope of this article, I have confined myself here to the most successful of these breeders. Besides Mr. Tochi Itoh, these are three Americans, Roger Anderson; the late Irene Tolomeo and Don Smith who are considered to be the most serious hybridizers all having devoted a significant portion of their lives to the development/improvement of the intersectional peony group. 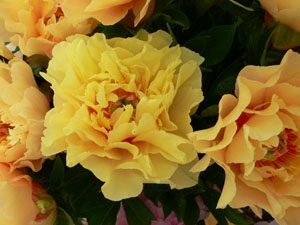 As mentioned above, the first breeder who succeeded in crossing herbaceous peonies with tree peonies, was Mr. Toichi Itoh, a leading Japanese peony breeder with the goal of creating a pure yellow flowered herbaceous peony. It has been reported that Mr. Itoh attempted more than 12.000 crosses before he finally succeeded with this very difficult cross. It is believed that 36 seedlings were eventually obtained from this cross. It has been reported that Itoh may have started making the intersectional cross as early as 1948, but the exact times seems to be uncertain. It is known that Toichi Itoh died in 1956, apparently without ever seeing the full fruits of his labour and that his work was then continued by his assistant Mr. Shigao-Oshida. It has also been reported that the first plants from these crosses began to bloom in or around 1964, but this is also uncertain and may have occurred earlier. 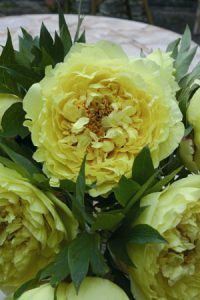 In either case, out of the original 36 seedlings, six were considered outstanding, and these became the first peonies of generally herbaceous character to have deep yellow, double flowers. In the late 1960’s, the American horticulturist Louis Smirnov visited Japan and obtained permission from Toichi Itoh’s widow to propagate; distribute and patent four of these plants. Louis named them Yellow Crown; Yellow Dream; Yellow Emperor and Yellow Heaven. The vigorous plants had the attractive foliage of their tree peony parent while retaining the herbaceous nature and increased hardiness of their herbaceous parent. Their appearance set off a storm of further hybridizing attempts. Irene Tolomeo was a serious amateur peony hybridizer from the wine country of northern California who devoted the last 20+ years of her life to the task of trying to create and improve the intersectional hybrids. Sadly, Irene passed away last year in February(2011) at the age of 86. Don Smith says: ‘Irene’s contributions are not that well known outside of the US peony community, but she created a number of excellent intersectional hybrids, of which 12 were named and registered with the American Peony Society’. A few are available commercially and have the serial name: Sonoma, the area where she lived and where she passed away. Her first registered variety was named Sonoma Sun(1996) and the last one was named Sonoma YeDo(2010). If there would be any passionate; renowned and leading intersectional peony hybridizer, it is undoubtedly Roger Anderson. In 1978, Roger and his wife Sandra established their peony business, Callie’s Beaux Jardins on about 4 hectares. Growing and hybridizing peonies was Rogers passion and it still is, in particular the intersectional ones. About his passion Roger says: ‘as a small boy I always had a soft spot in my heart for peonies; they were a favourite of my grandmother and though I like flowers of all kinds, peonies remained number one. In 1972, when I was 34 years old, my peony interests still remained strong. I joined the American Peony Society and became very interested in plant breeding. Breeders were in quest of a good yellow herbaceous peony type. 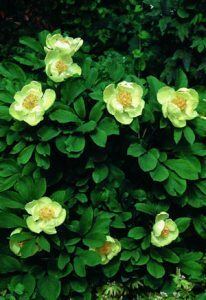 In the mid sixties of last century Mr. Toichi Itoh created a few yellow flowered plants by crossing Paeonia lactiflora x hybrid tree peony and this was what I also would try’! For 8 years Roger read many different books on plant breeding and made many different crosses, but, having little success. Finally in 1980 he found a lactiflora plant that accepted tree peony pollen and Rogers success story began. His most famous intersectional hybrid is the yellow Bartzella, which flowered in 1986 for the first time and has been distributed all over the globe since. Peony experts often describe Bartzella as ‘the most perfect yellow peony in the world’. 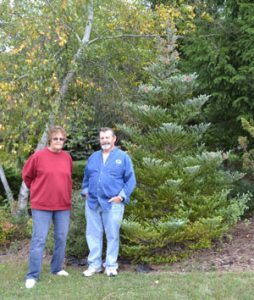 Since 1980, Roger has bloomed nearly 600 hybrids of which a small percentage has been registered. Today Roger continues to experiment with intersectional peony colours and varieties. Roger says; “I am at the age of 74, but still breeding for better ones.” Roger makes over 1000 crosses a year, in hope of producing the first F2 intersectional peony hybrid….a peony capable of producing seed for propagation. ‘My biggest joy in growing peonies is viewing the seedling garden in the spring’, says Roger. Roger and his wife who are long-time Fort Atkinson residents, donated 55 of their internationally acclaimed intersectional peonies as a living collection to the Hoard Historical Museum in Fort Atkinson, Wisconsin. The Museum is very pleased and proud to not only provide a home to showcase Roger’s exceptional intersectional peonies, but also to preserve his peony legacy as a living collection. A list of some Roger’s most popular besides Bartzella, are: Callies Memory; Cora Louise; First Arrival; Hillary; Julia Rose; Morning Lilac; Pastel Splendour; Unique; Scarlet Heaven; Sunshine Sensation and Lemon Dream. Don Smith is one of the tiny handful of breeders worldwide who are actively breeding intersectional hybrid peonies. When Don graduated from the FairleighDickinsonUniversity in Teaneck, NJ (USA) in 1966(MS in Physics) there were no signs that he ever would become a leading breeder of intersectional peonies. On the contrary, he instead enjoyed a very successful 37 years career as a Research Physicist for the Air Force Research Laboratory in Bedford, Massachusetts(USA), where his accomplishments as a research scientist were quite impressive. Besides being the author of numerous scientific articles in the field of infrared and atmospheric physics, Don became the program manager and scientific director of the first (non-NASA) scientific experiment to fly on the US Space Shuttle. He retired in 2003. Well before his retirement, however, Don began ‘playing-around’ with the intersectional cross in early 1990’s as a hobby, motivated and inspired by the landmark achievement of Toichi Itoh and the later successes of Roger Anderson. Don soon became hooked. 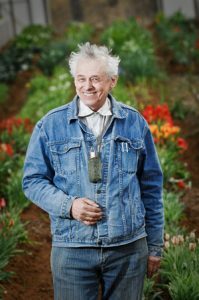 In 1995, he took over the publication of the peony hybridizers newsletter, Paeonia, and began writing and reporting about intersectional crosses and hybrids. Since his retirement in 2003, Don has devoted the bulk of his time to the task of trying to create new and improved intersectional hybrids. After 20 years of breeding intersectional peonies, there are now more than 250 intersectional seedlings from Don’s breeding efforts. The first of these began blooming in the Spring of 2000. 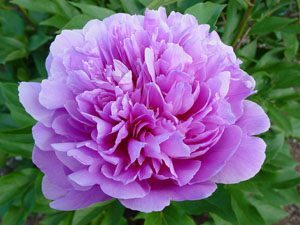 To date, 29 have already been named and registered with the American Peony Society(APS). His successes include the unique reverse-cross intersectional hybrid Reverse Magic and the remarkable , huge pink double Impossible Dream, the only known hybrid between the herbaceous peony lactiflora and the tree peony suffriticosa. 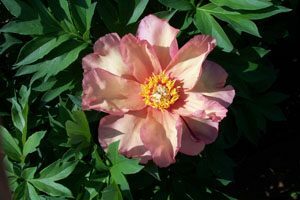 Don currently maintains several outstanding educational websites devoted to intersectional peonies and is widely regarded as one of the world’s leading experts on intersectional hybrid peonies. 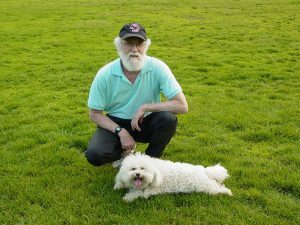 In May 2011, Don was awarded the highly coveted Saunder’s Medal by the APS, an award named in honour of Professor A.P. Saunders, America’s most successful and respected peony breeder. Now, more than 35 years after the original announcement by Louis Smirnow, it is my great pleasure and privilege to announce that the quest for the ‘impossible dream’ has finally come to an end. On June 2011, 2003, a remarkable new intersectional hybrid peony bloomed for the first time in my garden. This plant originated from a cross between STOLEN HEAVEN(Smirnov) a white semi-double Japanese tree peony, and a pink, single herbaceous(lactiflora) variety, known as MARTHA W. I had been waiting six long years for this plant to bloom and I am very happy to report that it was well worth the wait. The above and following few paragraphs are taken from Don’s article in the June 2004 issue of the APS Bulletin where he first described his outstanding accomplishment. Four weeks, I had been staring at the ten large buds sitting atop the very tall and straight stems of this plant wondering what they would finally reveal. Would they resemble the beautiful flowers in the photographs published in the Smirnov catalogue more than 35 years ago or would they be just another cruel disappointment. More likely, the flowers would turn out to be singles with good petals and I would be forced to wait at least another year to see if they would become more double in their second year of bloom, as is the case with so many of the first year intersectional’s. As the buds continued to grow even larger, one thing was becoming quite obvious: whatever these flowers would turn out to be, they would certainly be very large. But, would they be double and beautiful as well? As each day slowly passed, my excitement and anticipation continued to grow exponentially. Then, as I approached my garden from a distance on the morning of June 11, 2003 it became clear that this was the day I would finally get my answer. My heart began to race in anticipation. From more that 100 feet away, I could see several huge pink flowers waving proudly in the cool Spring breeze. I began to run as the anticipation became almost too much to bear. As I entered the garden, now a few feet away, I realized that I was about to experience the ultimate joy of seeing ‘a dream come true’. Clearly, the answer to both questions was a resounding ”YESSSSSSS!” At that moment, the only word that came to my mind was, WOW! The flowers were more than just beautiful….they were really quite spectacular. In fact, they were just about everything I had hope they would be. They were very large, very pink and very beautiful. Un questionably, this was the largest and finest pink intersectional hybrid that I ever had seen. I stopped for a few minutes to enjoy the moment. I thought about the first time I laid my eyes on my son and daughter. I thought about how blessed I felt, how lucky I was to have succeeded where so many others had failed. Then, I thought about the fact that I was the first, and at that moment still the only, person in the entire world who had seen this beautiful new creation. It was then that I realized that extraordinary moments like these are the magic and the lure of hybridizing. They are of course, the reason we spend so many hours in the garden and in the house working with pollen and seeds and plants, only to wait so many years to finally to see the first bloom. It is the hope we can create something of true beauty, which will last for the ages that gives us the patience and the perseverance to keep trying. So, what is in the future of these fantastic plants, the intersectional peony hybrids? It’s likely that their colour range will continue to expand, to pure white and exotic blends and bi-colours. Also expect to see distinctive foliage, the possibility of repeat bloom in the autumn, and fully fertile plants that will make breeding them less of a challenge. But more important, as they become better known and more intensively propagated, their price will surely fall, making these peonies of the future increasingly available to gardeners across the world.